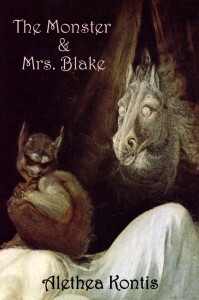 I am so excited that my short story “The Monster & Mrs. Blake” is a Featured Story on Wattpad this week! Click here, or on the cover illustration at the right to read the story (for free!) on Wattpad. As always, PLEASE ENJOY AND SHARE! This entry was written by Princess Alethea and posted on March 10, 2014 at 11:31 am and filed under Short Stories. Bookmark the permalink. Follow any comments here with the RSS feed for this post.